The DV-PC2HD is an HDMI converter which converts a variety of analog PC signals and stereo audio to HDMI. It’s ideal for applications with sources that do not provide an HDMI output such as older PCs and laptops. The signal resolution at the HDMI output is dependent on the analog PC input’s resolution. The unit is easy to install, operate and does not require any adjustments. 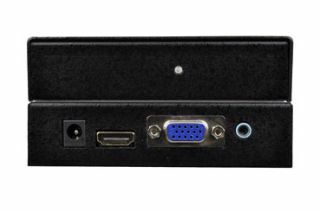 Key features of the DV-PC2HD analog PC to HDMI Converter include: power LED, 5VDC power input, HDMI output, HD-15 input and 1/8-inch stereo audio input.